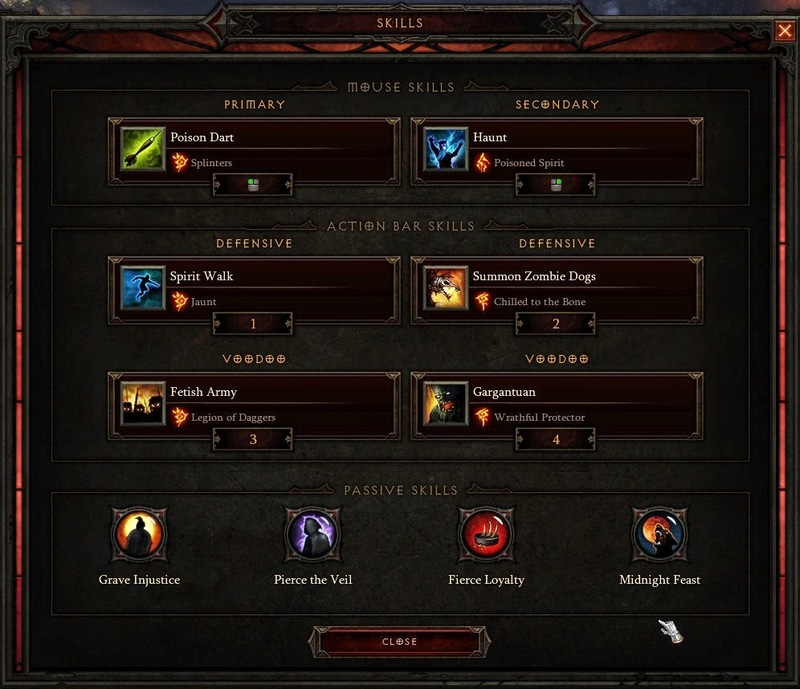 The following guide and video have been created on April 4, 2015 on the Diablo 3 Patch 2.2 PTR, build 30894. Note that anything shown here may be subject to change until the final release candidate build goes live. The item links provided here will be active or updated (for reworked items) once patch 2.2 went live on April 7/8. The Diablo 3 Patch 2.2 will be released this Tuesday, April 7, 2015, heralding the start of Season 3. The synopsis of the latest content update is that it makes many more character builds viable for Torment 6 difficulty thanks to new and revised items as well as several new game mechanics. Especially hardly used primary and secondary skills including associated (older) legendary items will profit a lot, and defensive shortcomings have been addressed, too, to make such builds work in Rifts and higher level Greater Rifts. 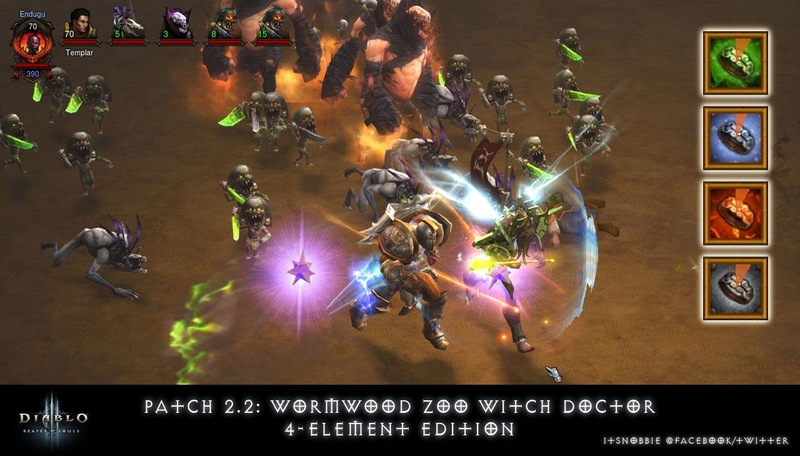 The following guide for the popular witch doctor demonstrates how the patch encourages you to add more variety to your builds, in this case through the use of the new Convention of Elements ring. If you have been waiting for an update that allows you to effectively use all elemental damage types in one single witch doctor build, this guide is for you! 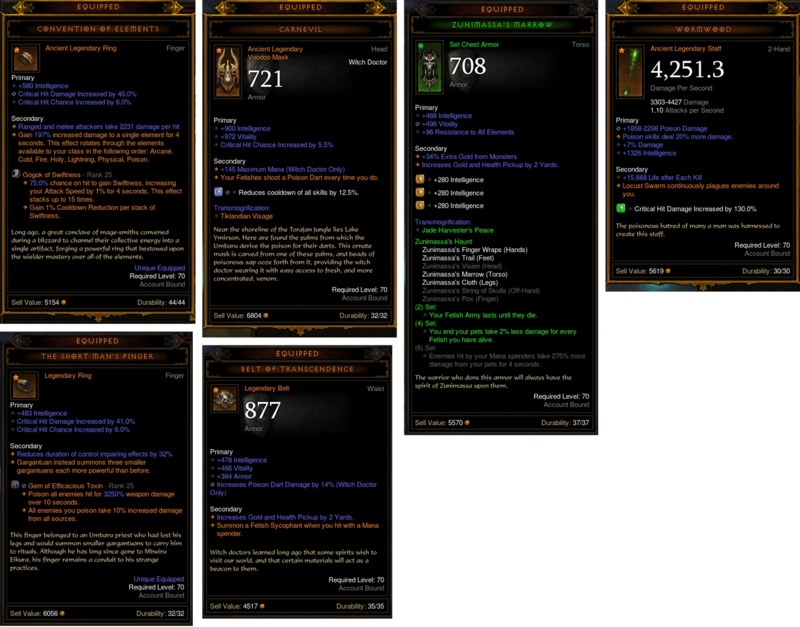 The new Convention of Elements (CoE) ring of patch 2.2 (see the upper left item tooltip in the following picture) is one of the most interesting Diablo 3 legendaries so far, and the central item of this build. It introduces a new mechanic that works as follows: Depending on your class, or rather the elemental damage types your class masters, the ring cycles through each of these elements and significantly boosts one of them at a time for several seconds. To use the witch doctor as an example, he/she can deal Poison, Fire, Cold, and Physical damage, and the ring cycles in exactly that order through these four elements giving each spell of the respective element a (currently) 150-200% damage bonus for 4 seconds. Assuming that you got a perfect CoE roll with 200% damage bonus, this means that each element gets an average 50% damage boost over the course of one complete 16-second cycle (4 elements per 4 seconds). This by itself is already a great bonus, which should make a good (Ancient) CoE a better choice now than the pre-patch 2.2 BiS (Best in Slot) Stone of Jordan (SoJ) ring. And it gets even better: Because each element is included in the rotation, you have now the option to pick the best spell(s) per element and combine them into one powerful build. An example: Before patch 2.2, if you wanted to use the mighty Wrathful Protector with its massive fire damage attacks as "elite" killer, you'd focus on increasing your fire damage bonus through a SoJ, Cindercoat, Magefist, enchants etc. Now, you'd simply use the CoE ring and get a 50% average damage boost to fire for your Wrathful Protector who lasts 15 seconds, which is almost a complete ring cycle (16 seconds). Which "best" spells you could pick for the other elements (Posion, Cold, Physical) is discussed in the SKILLS section below. The "base" of this build is Zunimassa's Haunt, which gains a lot of power in the reworked patch 2.2 version. The updated classic witch doctor set now consists of 7 instead of just 5 items (gloves & pants have been added), and we'll be using 4 items (see the above picture) to activate the 2- and 4-piece bonuses. 2 Zunimassa pieces grant us a permanent Fetish Army, and 4 pieces a big, sorely needed defense bonus depending on how many fetishes we have alive. Note that active Fetish Sycophants will be included here. The 4 Zunimassa set items will therefore be complemented with the new Belt of Transcendence, which does exactly that: It spawns Sycophants whenever we hit with a Mana spending spell, and it lets us get rid of the Sycophants skill to make room for another passive of our choice - a great pet doctor belt! For the head slot we'll be using Carnevil, which is hands down the best pet doctor voodoo mask even without its perfect complement, the Dagger of Darts ceremonial knife. With Carnevil all of our fetishes (incl. Sycophants) shoot a Poison Dart every time we do, which lets us deal both great area and single target damage in a very convenient manner. Instead of the (piercing) Dagger of Darts and a mojo, the Wormwood staff with its auto-cast Locust Swarm (at zero Mana costs) is my weapon of choice, and this has several reasons. First of all, the 2-handed Wormwood staff is much easier to find (and especially to gamble) than the very rare Dagger of Darts, and chances are very good that you get an Ancient, hard hitting one with 4.000+ DPS (damage per second). Secondly, the Locust Swarm auto-cast of the staff doesn't require you to have the spell on your bar (unless you choose to in order to get access to a special rune), and the auto-cast counts as Mana spender to spawn the Sycophants via the aforementioned Belt of Transcendence. Last, but not least, the new defense bonus of the reworked Zunimassa set finally allows us to ge rid of (defensive) mojos like the Uhkapian Serpent and use this great staff instead. If you combine the auto-cast Locusts with a spell like Haunt (see the SPELLS section below), you get great DoT (damage over time) and damage amplifciation in any situation, which are easily on par with, if not better than piercing Poison Darts (through the Dagger of Darts knife). The second ring, which complements Convention of Elements (CoE) in this special zoo doctor build, is the new The Short Man's Finger (SMF), previously known as Little Man's Finger (Note that this ring will be an exclusive Season 3 Item). What the ring does is that it makes your Gargantuan spell instead summon three smaller Gargantuans, each more powerful than the original. If you choose the Wrathful Protector (rune) with its massive fire damage attacks and increase its elemental damage even further through the CoE ring, you get a trio of Gargantuans that is nothing less than an engine of destruction! Since we'll use a fair amount of Cooldown Reduction (CDR) for this build, this devastating fiery weapon is almost always available for use. Two legendary gems (out of three max.) are recommended for this pet build: Bane of the Trapped because our spell arsenal involves control-impairing effects (Cold Zombie Dogs & Knockback Gargantuans), and Gogok of Swiftness to speed up our and our fetishes' Poison Darts. As third gem you may want to pick a defensive one like Esoteric Alteration or the Molten Wildebeest's Gizzard from Season 2. As mentioned above, we're gonna choose some "best of each element type" spells (Poison, Fire, Cold, and Physical) because our zoo doctor is built around the Convention of Elements (CoE) ring. The main attack is Poison Dart (Splinters rune) because we'll be using the Carnevil voodoo mask (see the ITEMS section above). With Carnevil all of our fetishes (incl. Sycophants) shoot a Posion Dart every time we do, which lets us deal both great area and single target damage in a very convenient manner. Fetish Sycophants damage, by the way, is now increased by your highest elemental damage type at the time of summoning, e.g. Poison, which is our focus for gear enchants. The secondary attack is Haunt (Poisoned Spirit rune) which complements the auto-cast Locust Swarm of our Wormwood staff, providing great DoT (damage over time) and damage amplifciation in any situation. In the fire department, the Gargantuan (Wrathful Protector rune) is hands down the most powerful direct damage spell since it got updated a while ago. This fiery monstrosity, which will be transformed into an incredible trio through The Short Man's Finger ring, literally crushes Torment 6 difficulty and hammers its way through (high-level) Greater Rifts while we and our fetishes pelt the foes with dozens of Posion Darts. Patch 2.2 provides pet doctors with a wonderful new, Cold based Zombie Dogs rune called "Chilled to the Bone", which replaces the old "Final Gift" rune: Enemies who hit or are hit by your Zombie Dogs are Chilled and take increased damage. These chilling dogs, and the Gargantuans with their knockback fire attacks, are standing in the front line providing the control-impairing effects for the bonuses of the Bane of the Trapped gem. The physical damage portion is provided by the Fetish Army (Legion of Daggers rune). While they, and their Fetish Sycophants siblings, fire Posion Darts at your command most of the time, they can also deal massive physical damage if you are otherwise engaged, i.e. have been trapped or flee. The sixth active spell in our arsenal is Spirit Walk (Jaunt rune), the very efficient mobility and escape skill. Great Cooldown Reduction (CDR) in addition to the CDR you should have on your gear (~25-30%). Great, cost-effective damage buff because the zoo doctor hardly uses Mana. Great movement speed buff (while not in combat), and 1 additional Zombie Dog. Another additional Zombie Dog (5 total in this build), and a great damage buff for your Zombie Dogs and Gargantuan. The following test run has been recorded on the patch 2.2 PTR (without legendary drop rate buff) in a Torment 6 Rift. Note how this build is able to farm high game difficulties very fast and efficently. It's good for Greater Rift farming up to level 40, but most importantly, it is FUN! Getting an ultimate, almost godly weapon like an Ancient Starmetal Kukri can take a very long time, and you want to enjoy playing until then as much as possible.